Thanksgiving is rapidly approaching. Now is the time to start planning your menu. Over the next week, I will share some of our family’s favorites. We love our cranberry sauce around here, especially on leftover turkey sandwiches the next day. The addition of orange peel and juice, and a hint of cinnamon gives this cranberry sauce a nice tang. The picture above is a Sugar Free version, made with stevia. The recipe below includes instructions for making it with full sugar or a sugar substitute. In the past I have had problems getting a proper gel with sugar substitutes, so I now add a little unflavored gelatin (Knox). I like it sprinkled with toasted finely chopped pecans, but the kids don’t like it as much this way, so I usually leave it plain. Place water in a medium saucepan. If using a sugar substitute, sprinkle gelatin over water and let stand 5 minutes. Heat to a boil. Stir in orange juice, sugar (or substitute), cinnamon stick and orange peel. Return to a boil; boil 5 minutes. Stir in cranberries, return to a boil. Boil 5 minutes or until cranberries pop. Remove from heat and remove cinnamon stick. Serve warm or cold with toasted pecans. **NOTE: Sugar substitutes vary a lot in sweetness, especially stevia. I use Sweet Leaf brand powdered stevia and usually use about 1/2 tsp. 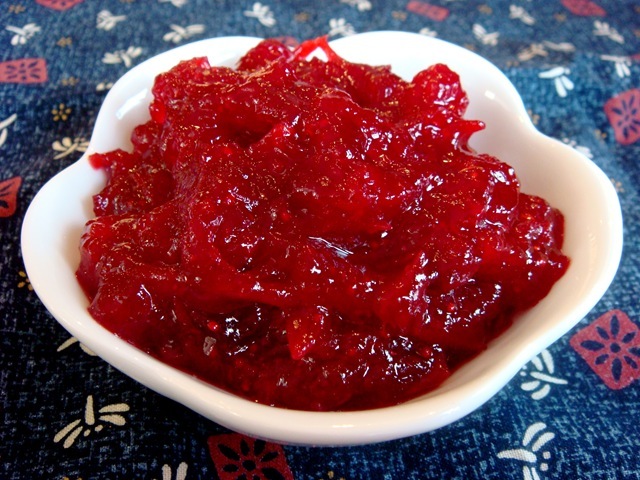 Start on the low side; taste cranberry sauce and add more to your taste, if necessary. You can also use part sugar/part sugar substitute. Thank you so much for sharing this recipe. I am not for sure if I could find cranberry in a can here so just knowing that I can make my own is breath taking! That sounds really good!I love the tartness of fresh cranberries. Just trying to figure out the amount of sugar substitute to use — in the top part of the recipe it says use 1 c, but later on you mention only 1/2 tsp of stevia. A few years ago I made a cranberry sauce with 1 bag of berries and 1 c of Splenda and thought that it tasted terrible, so I would like to try the stevia, but trying to figure out how much to add. Thanks! If you are going to use regular sugar, the amount would be one cup. Splenda is supposed to measure cup for cup like sugar, so it should be about the same amount (the 2C cranberries in the recipe is not a full bag of cranberries, it is more like half a bag?). Stevia is much more concentrated than sugar or Splenda, so you only need very small amounts. I use SweetLeaf brand stevia, and I used 1/2 tsp. We like it a little on the tart side, so start with 1/2 tsp stevia, cook it, then taste it. Because stevia is not grainy like sugar, you can add more at the end of cooking without affecting the texture (but just a very little at a time or it will quickly turn bitter). I’ve been laid up with a torn rotator cuff for the last 6 weeks (surgery next week – yay!) and haven’t been able to play in the kitchen to make a cranberry sauce with a natural, non-sugar sweetener in it. Your recipe is VERY close to my old one and I can’t thank you enough for posting this! I copied this to my blog, giving you credit several times. Thank you so much, I was almost tempted to just give up and buy that gloppy crud in a can. You’re a lifesaver!